Please read the following guidelines carefully before submitting your abstract. Changes cannot be accepted after the deadline. Follow the instructions of the JOS Scientific Program Committee for post-review revisions. The presenters must be JOS members who have paid the fiscal 2018 annual membership fees. There may be up to two non-member co-authors. The presenters are required to register for the meeting in advance. See the categories listed below and choose up to three items by number that match with your presentation. All submitted abstracts will be reviewed by the JOS Scientific Program Committee (Accredited Orthodontists Committee for case reports). The Committee may request changes in exhibit types or in topic categories. Abstract submissions may be rejected. Decisions on acceptance will be posted on this website in the middle of August (no notification will be made to individual applicants). The Excellent Presentation Award is designed as below. 2. Subjects of award: Exhibits consisting of an academic exhibit and a case exhibit, and oral presentation. The number of awards depends on the fields of the exhibits. 3. Screening: Selected by the Screening Committee consisting of the Scientific Program Committee members and several other members additionally designated by them. 4. Commendation: Awards are granted under the name of the Chairman of the JOS. Award-winning exhibits are displayed with a citation at the meeting and also published in JOS academic journals. An award certificate is presented to the first award winner. When submitting your abstract as the subject of the award screening, please select "We hope to be a candidate" for the item “Nomination for the Excellent Presentation Award” on the Abstract Submission page. The Secretariat assumes no responsibility for any problems with submission of abstracts due to the user's computer environment. In the UMIN online abstract submission system, web browsers other than Internet Explorer, Safari, Firefox(version 2.0.3 (417.9.2) or after) and Google Chrome are not available. All notification of problems in networks and servers will be made through the official website of the Meeting. Inquiries through other means will not be accepted. Congestion is anticipated in access to the website right before the deadline. Submit your abstract well in advance to avoid possible problems. - You should use the [registration page] when submitting your abstract for the first time. - To make any revisions, you should use the [confirmation page] for your registered abstract. You will then need a registration number, to be automatically issued, and a password of your choosing. - Please keep the registration number and the password to yourself. - You should use the [registration page] only once for each abstract. The [confirmation page] should be used thereafter. 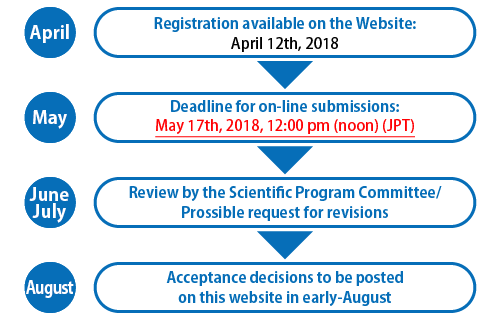 - Please note that if you use the [registration page] at each revision, multiple registrations will be created for the same abstract. Please be advised that presentation acceptance may be canceled at the discretion of the Scientific Program Committee in some cases including the following: the content of the relevant presentation lacks sufficient ethical consideration or personal information protection, and appropriate measures to manage conflicts of interest that may be caused by academic-industry cooperative activities have not been prepared. Conflicts of interest(COI) disclosure is prerequisite when the author(s) make(s) poster presentation. The abstract should meet the following requirements. Contents Should be original research of academic significance. Objective Should be stated clearly. Materials and Methods Should be described clearly and quantitatively. Should be appropriate for the given objective. Trials targeted at humans should observe the spirit and ethics of the Helsinki Declaration. Trials targeted at animals should also have been conducted ethically. Results Should be stated clearly. Conclusion Should be stated clearly and should not be incomplete or predictive in nature. Should agree with the title and the objective. Format Follow the " Abstract Preparation Guidelines"
Discussion and Summary Discussion should be logical and clear. - The number of co-authors, including the presenter, should not exceed 15, and the number of affiliations should not exceed 10. - Organizations cannot be authors. - The title of the abstract, when in English, should contain no more than 15 words. A capital letter should be used only at the beginning. A period at the end is not necessary. - The main body of the abstract, when in English, should contain no more than 250 words. - Affiliations and (co-)authors, the title of the abstract, and the main body of the abstract, when in English, should contain no more than 370 words. It is recommended that the text of the abstract be prepared using your word processing software and be pasted into the form using the copy-&-paste feature. Indentation Left-align text to fill in blank spaces. This also applies to the main body of the abstract. Please do not use line breaks. Symbols and Greek Letters Please read the instructions given immediately above the abstract body input space on the registration page. Superscripts, subscripts, italics, bold type and underlining may be used in the title of the abstract. Please read the instructions given immediately above the abstract body input space on the registration page. Units Use CGS (centimeter-gram-second) units for measurable quantities. Graphs and Tables Graphs and tables cannot be attached to abstracts. Use of trademarks As a general rule, the use of trademark names is not permitted. When their use is inevitable, please put them in parentheses following generic names. Trademarked names should not be used in a title. References When necessary, only one reference may be given at the end of the abstract in the format: "First author (Abbreviated journal name, year issued)." *Changes cannot be accepted after the deadline. *All abstracts are required to respond the questions related to your research and send back the form to the Registration Secretariat (Email：jos2018-endai@congre.co.jp) by Email. １）In principle, photographing and video recording are prohibited in order to protect patients’privacy. Participants can shoot only exhibits indicated by a “Photography/videotaping allowed” sign. Presenters must attach the sign to their exhibit panels or desks. If you are a presenter of such an exhibit, be sure to pay close attention to the protection of patients’privacy. ２）Please be sure to duplicate poster exhibits before displaying. JOS and the Secretariat are not responsible for any loss or damage of displayed poster exhibits. １）Academic Exhibits will be displayed on October 31 (Wed.) and November 1 (Thu.). The display will not be changed throughout the 2 days. ２）Exhibit presenters are required to carry the exhibits into the hall from 9:00 to 10:00 on October 31 (Wed.) and carry them out from 16:00 to 17:00 on November 1 (Thu.). Presenters do not need to come to the reception desk when carrying exhibits into the hall. Drawing pins will be provided, together with exhibit panels. Use of adhesive or other tape is not allowed. Please be reminded that the Secretariat will dispose of all exhibits left after the designated carrying-out time on November 1 (Thu.). ３）Please adhere to the following guidelines in displaying academic exhibits. A.　Exhibit numbers will be allocated by the Secretariat. C.　Desks 120 (W) x 45 (D) x 70 (H) cm will be provided to presenters, as per prior request. Note that use of a desk will reduce the size of attachment area of poster exhibit panel to 120 (W) x 140 (H) cm, including area for attaching presenter’s photo and exhibit title. Note also that requests for additional desks on exhibition days will not be accepted. ４）A question and answer time is scheduled for November 1 (Thu. ), from 12:00 to 13:00. Presenters are requested to remain in the vicinity of their display area during that time. ５）We require all poster presenters to disclose COI related to their topics. Please list any financial relations with commercial interests to place a poster. If there is nothing to disclose, presenters are also required to place a poster to demonstrate nothing to disclose. * Please see HERE for how to disclose COI. Follow above instructions (1) to (5) for academic exhibit presenters. A presenter has eight minutes for presentation and two minutes for questions and answers. Topics are selected from submitted abstracts. Details will be provided to relevant individuals separately. We require all oral presenters to disclose COI related to their topics. Please list any financial relations with commercial interests in the presentation slide. If there is nothing to disclose, presenters are also required to include in the slide to demonstrate nothing to disclose. * Please download the sample slides HERE.